And love to read you answers! Would love to travell and see more of the world too! Thank you so much for nominating my blog! I enjoy your blog, as well. Congratulations and Thank You; that is so very sweet of you. “Travel All-Inclusive: Tails of Affection”. Thank you so much for nominating furrylittlegnome, and a big congratulations to YOU! Your blog is great! Congratulations Joseph!!! You do have One Lovely Blog and I am a fan! Thank you very much for nominating me and I appreciate it. I am writing to you from Australia. Once back to California, I will check-out your new posts and also pass on your kind nomination. 😀 Fae. Thanks. Have a great time in Australia. 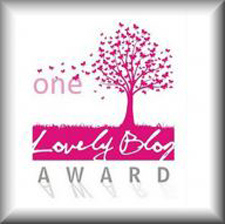 I passed the One Lovely Blog Award to 17 bloggers, thanks to you! Congratulations! This is a very appropriate award for your blog 🙂 I would also love to have a dog but because I live in a rather small apartment I unfortunately can’t. And I definitely agree that goodness spreads in all directions. Congratulations. ‘The goodness of a person spreads in all direction. I would like to be kind whenever possible because it is always possible if you try.’ This is lovely. Thank you. I wrote that for the reason that to be good is noble because the welfare of each is bound up in the welfare of others. I too enjoyed reading your post. I traveled to Italy recently and saw The Pieta at St. Peter’s Basilica, amazing. I cried and cried. It is absolutely beautiful. I’ll check out the list of blogs you follow. I am loving our WordPress community and connecting with other folks. Thank you! Belated congratulations! From travelsights to insights, I really love your blog! Again, kudos for the award!